The distribution of epithelial E-cadherin, basement membrane type VII collagen, and underlying connective tissues fibronectin were investigated immunohistochemically and compared in normal palatal mucosa and in denture-related stomatitis (DRS) derivatives using monoclonal antibodies.Biopsies of palatal mucosa were obtained from twelve patients enrolled in this study, 8 with type II DRS and 4 with healthy mucosa. Our findings bring to the fore, using the expression of three components (E-cadherin, collagen type VII, fibronectin), the continuities of the disorder among epithelial, basement membrane and connective tissue in the case of DRS. In type II denture-related stomatitis, we found an expression of E-cadherinin all the strata of epithelia, and the diffuse and strong expression of type VII collagen at the interface between connective tissue and epithelial cells with discontinuities in BM. The strong expression of fibronectin in underlying connective tissue with penetration in some areas of the palatal mucosa may be an early consequence of advanced DRS. Nevertheless; no single change is pathognomonic of this inflammatory process. 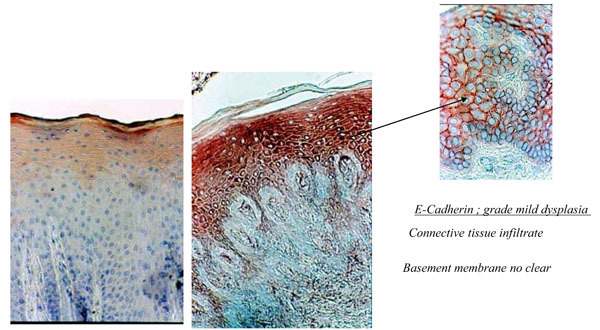 In normal tissues (healthy clinical aspect), E-cadherin was found to be restricted to the upper strata of the epithelia, and type VII collagen revealed thin linear staining in the basement membrane and fibronectin in underlying connective tissue combined epithelia. In the case of denture-related stomatitis DRS, these three markers reflect the immunohistological modifications from the superficial layer of the epithelium to the lamina propria. Keywords: Denture-related stomatitis, E-cadherin, type VII collagen, fibronectin, Candida albicans infection. © Le Bars and Soueidan; Licensee Bentham Open. Adherent and healthy mucosa tissues covering the residual ridge and palate are very important criteria for the clinical success of wearing full dentures [1Shulman JD, Rivera-Hidalgo F, Beach MM. Risk factors associated with denture stomatitis in the united States J Oral Pathol Med 2005; 34(6): 340-6.]. Denture-related stomatitis (DRS) is an inflammatory process affecting the oral mucosa of denture-bearing tissues. The prevalence of denture stomatitis is around 30% in patients with complete prostheses [2 Gendreau L, Loewyzg ZG. 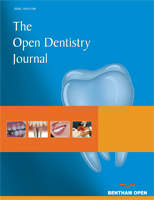 Epidemiology and etiology of denture stomatitis J Prosthodont 2011; 20(4): 251-60.-4Cunha-Cruz J. One in 3 removable denture users in the United States has denture stomatitis J Evid Based Dent Pract 2006; 6(2): 197-8.]. The pathogenesis of denture stomatitis is still unclear, but a combination of trauma/stress, Candida infection, poor denture hygiene and wearing dentures 24 h a day have all been suggested as etiologic factors [2 Gendreau L, Loewyzg ZG. Epidemiology and etiology of denture stomatitis J Prosthodont 2011; 20(4): 251-60., 4Cunha-Cruz J. One in 3 removable denture users in the United States has denture stomatitis J Evid Based Dent Pract 2006; 6(2): 197-8.]. Wearing full dentures may stress the underlying connective tissue and epithelia, and create a favorable environment for the development of yeast like Candida on the oral mucosa. In denture stomatitis, the oral mucosa often exhibits inflammatory hyperplasia with granulation and reactive tissue overgrowth [5Coulthwaite L, Verran J. Potential pathogenic aspects of denture plaque Br J Biomed Sci 2007; 64(4): 180-9.]. However, the histopathological appearance of the epithelium associated with DRS has been investigated very little to date. Healthy oral epithelium can be characterized with E-cadherin and thin basement membranes (BM), rich in extracellular matrix proteins supporting the growth of keratinocytes and fibroblastic cells [6Arun R, Hemalatha R, Arun KV, Kumar T. E-cadherin and CD1a expression in gingival epithelium in periodontal health, disease and post-treatment Indian J Dent Res 2010; 21: 396-401.]. The main components of BM are laminin, type IV collagen, fibronectin, type VII collagen and proteoglycans. Laminin, the most abundant non-collagenous extracellular matrix protein in BM, has multiple structural and functional roles in tissue development. Type IV collagen provides the basic, strong membrane while fibronectin plays a key role in tissue development and healing through cell matrix binding sites. Anchoring fibrils in the lamina densa, composed mainly of type VII collagen, are known to maintain the integrity of tissues. Wearing full dentures applies mechanical stress to the epithelium and connective tissue [7Sakai LY, Keene DR, Morris NP, Burgeon RE. Type VII collagen is a major structural component of anchoring fibrils J Cell Biol 1986; 103: 1577-86., 8Osawa T, Liang JC, Xie X, Nozaka Y. Study on the epidermal basement membrane (2): localization of type VII collagen determined by immunoscanning electron microscopy with back scattered electron imaging Connect Tissue 1998 b; 30: 11-3.]. These forces may affect the integrity of these tissues and the organization of extracellular matrix components such as E-cadherin, type VII collagen and fibronectin. As previously reported in oral epithelial dysplasia [9Warnakulasuriya S, Reibel J, Bouquot J, Dabelsteen E. Oral epithelial dysplasia classification systems: predictive value, utility, weaknesses and scope for improvement J Oral Pathol Med 2008; 37: 127-33. ], studying both histological modifications in the basement membrane and microbiological aetiopathogenic factors would be helpful for preventing and treating denture-related stomatitis [10Figueiral MH, Azul A, Pinto E, Fonseca PA, Branco FM, Scully C. Denture related stomatitis : identification of aetiological and predisposing factors: a large cohort J Oral Rehabil 2007; 34(6): 448-55.-12 Sachdeo A, Haffajee A, Socransky S. Biofilms in the edentulous oral cavity J Prosthodont 2008; 17: 348-56.]. The purpose of the present study was to investigate tissue modifications (E-cadherin, coll VII, fibronectin) induced by wearing full dentures in DRS. We compared patients who had been wearing full dentures for more than 3 years, and who had DRS, with patients who had similar denture histories and had clinically healthy mucosa. Colonization of the palatal mucosa by Candida was observed using microbiology culture tests. In the same patients, the modifications in the anchoring fibrils and underlying connective tissue in the palatal mucosa were studied using immunohistochemistry. Our goal was to show the organization of E-Cadherin, the type VII collagen and fibronectin components of the extracellular matrix in biopsies first taken from healthy subjects and secondly from patients with DRS. Our study then carried out a comparison of these two situations. 12 patients (4 women, 8 men; 50-70 years old) who had worn full dentures for more than 3 years, and 10 healthy patients without dentures, gave their informed consent to participate in the study. The source of patients was both private clinics and hospital. The whole clinical study was performed in accordance with the Helsinki II Declaration after approval by ethical committee of Nantes Hospital. The diagnosis of denture-related stomatitis (DRS) was made according to the Budtz-Jorgensen classification [13Budtz-Jorgensen E. Oral mucosal lesions associated with the wearing of removable dentures J Oral Pathol 1981; 10: 65-80.]. Classically, DRS has been classified into three clinical types: Type I, a simple, localized inflammation or pinpoint hyperemia; Type II, an erythematous or generalized form presenting a more diffuse erythema involving all or part of the denture-covered mucosa (Fig. 1a ) and Type III, a granular form (inflammation papillary hyperplasia) commonly involving the central part of the hard palate and the alveolar ridges. Type III is often seen in association with type I or type II, but two varieties are usually observed: (i) atrophic denture stomatitis with erythema and (ii) papillary or hyperplasic denture stomatitis (Newton classification) [14Newton AV. Denture sore mouth Br Dent J 1962; 112: 359-60.]. Biopsies of clinically healthy palatal mucosa, which had never been covered by removable dentures, were sampled in five patients (aged 20 to 40) who served as a control group (Clinical Healthy Mucosa, CHM control). The biopsy site was approximately midway between the alveolar ridge and the level of the palatal blood vessels opposite the first molar tooth. An adrenaline-free local anaesthetic was applied and a cut was made through the full mucosa thickness with a 3 mm diameter trephine-type biopsy punch. The resulting column of tissue was dissected free from the periosteum with care being taken not to abrade the epithelial surface. 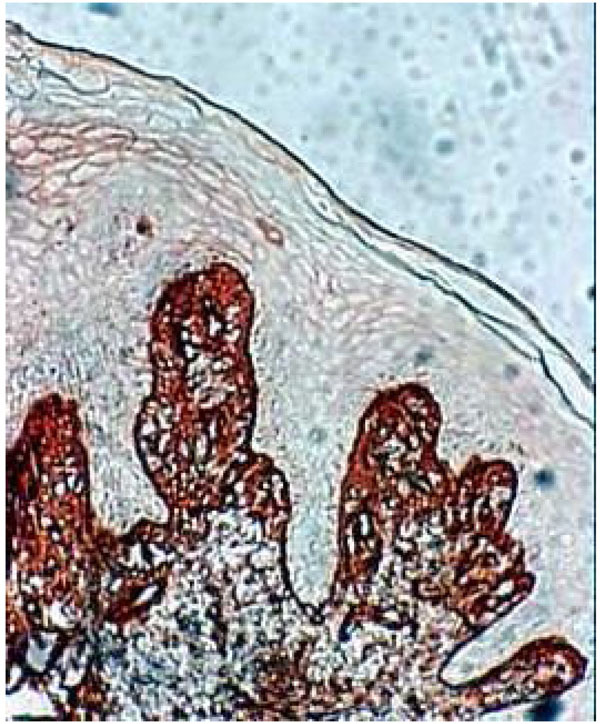 Examination of the sections stained using the Mallory technique made it possible to determine the type of keratinization on the epithelial surface. (1a) Clinical aspect of palatal stomatitis (classe II Budtz Jorgensen) and (b) clinical healthy palatal mucosa. Specimens for cytological and microbiological sampling were obtained with a cytobrush prior to the collection of biopsy tissue under the dentures of clinically healthy patients and those whose palatal mucosa showed signs of denture stomatitis. The specimens were immediately smeared onto two coded glass slides and fixed with a spray fixative. One slide for each patient was stained using the Papanicolau technique, and the other using the Periodic Acid Schiff (PAS) technique. The relative amount of the different cell types (parabasal, intermediate and superficial) in each slide was calculated according to the Frost maturation index (Frost KJ). Candida colonization was assessed with imprint cultures from the hard palate. The group consisted of C albicans, C krusei, C glabrata, C tropicalis isolates. Isolates were identified on the basis of germ tube formation and chlamydospore production and using the API 20C AUX yeast identification system (bioMérieux,Marcy-l’Etoile, France) and BBL Mycotube (Becton Dickinson Microbiology Systems, Cockeysville, Md) identification systems. The culture and storage of the strains were carried out by standard methods (National committee for Clinical Laboratory Standards, NCCLS document M27-T). Each foam square was removed and placed firmly on Sabouraud’s dextrose agar (SDA, Acumedia Manufacturers Inc., Baltimore, Maryland, USA) and CHROM agar (CHROMagar TM Candida, CHROMagar, Paris, France) for fungal growth in order to ensure purity and viability. Histological examinations were carried out on biopsies of the palatal mucosa. The biopsy site was approximately midway between the alveolar ridge and the level of the palatal blood vessels opposite the first molar. A biopsy was carried out with local anesthesia (vaso-constictor mépivacaïne 3%), and cut with a n°15 bistouri blade (area 3 mm x 3 mm, depth 1,5 mm). Excision biopsies from the palate were immediately fixed in 10% formalin, dehydrated in graded alcohol and embedded in paraffin. Thin serial sections (5 μm) were deparaffinised and stained with Goldner’s trichrome (Mallory Azan variety) for histological diagnosis. 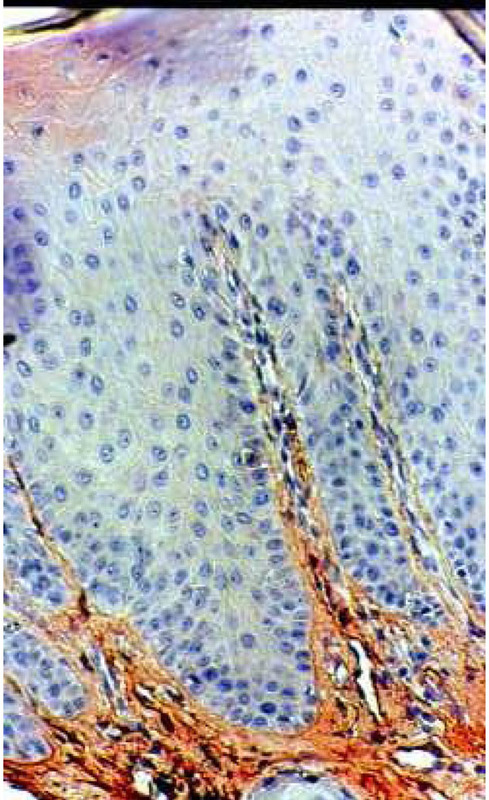 Immunohistochemistry was performed with a Dako LSAB R2 kit (Dako A/S, Glostrup, Denmark), which uses a horseradish peroxidase (HRP) technique based on sequential application of a secondary biotinylated antibody and peroxidase–labelled streptavidin [15Guesdon JL. The use of avidin-biotin interaction in immunoenzymatic techniques J Histochem Cytochem 1979; 27: 1131-9.]. Enzymatic pre-treatment with 0.2 mg/ml trypsin (Sigma, St. Louis, MO, USA) for 5 min at room temperature was performed prior to the immunohistochemical procedures [16Cordell JL. Immunoenzenmatic labelling of monoclonal antibodies using immunecomplexes of alkaline phosphatase and monoclonal anti-alkaline phosphatase conjugates in immunohistochemistry J Histochem Cytochem 1984; 3é: 219-9.]. Sections were pre-treated with 0.3% hydrogen peroxide for 5 min to abolish endogenous peroxidase activity and then with normal non-immune serum for 5 min to eliminate any non-specific binding sites before incubation at room temperature for 2 h with primary monoclonal antibodies. Monoclonal mouse anti-human L-cam (Uvomoruline, E-cadherin) diluted at a 1:20 ratio (Euro-Diagnostica Holland for Cappel-Ref 10704) was employed to visualize E-cadherin (Monoclonal mouse anti-human type VII collagen diluted 1:1000 (Sigma Chemical Company Product No C – 6805 Lot 02744817), which reacts with the C terminal non-helicoidal domain of type VII collagen. Monoclonal mouse anti-human fibronectin diluted 1:20 (Euro Diagnostica (Holland) for Cappel – Ref 10107) was employed to visualize the fibronectin [17Christensen L. Fibronectin, laminin and tetranectin in human breast cancer with special attention to extracellular matrix APMIS Suppl 1992; 100(suppl): 6-39.]. After washing, the sections were incubated with a biotin-labelled anti-mouse secondary antibody for 10 min before incubation with the streptavidin-peroxidase complex for 60 min. To visualize the immunoreactivity, 3% 3-amino-9-ethylcarbazole (AEC) was used as the chromogenic substrate for the peroxidase. After rinsing for 10 s in a hematoxylin bath, the specimens were mounted and cover-slipped with an aqueous-based mounting medium (GlycergelR). For the negative controls, an irrelevant antibody with the same Ig-isotype(s) as the primary antibody was used. Grade 4 (G4), discontinuities or disruptions in the borderline staining: +/-. According to Thorup et al. [18Thorup AK, Dabelsteen E, Schou S, Gil SG, Carter WG, Reibel J. Differential expression of integrins and laminin 5 in normal oral epithelia AMPIS 1997; 105: 519-30., 19Thorup AK, Reibel J, Schiodt M, et al. Can alterations in integrins and laminin -5 expression be used as markers of malignancy? APMIS 1998; 106: 1170-80. ], the grade of inflammation in connective tissue was assessed as: i) absence characterized by no or few scattered inflammatory cells), ii) slight, with scattered inflammatory cells, iii) moderate with less distinct tissue structure because of inflammatory infiltrate, or iv) severe, with the structure completely modified by the inflammatory infiltrate. Twelve patients (4 women, 8 men) with complete upper dentures for more than 3 years and 10 healthy patients as the control group were included in this study. The ages of the patients ranged from 50 to70 years (60+/-1) and the participants were evaluated intra-orally at the beginning of the study. Eight patients showed clinical signs of type II denture stomatitis of the mucosa according to the Budtz-Jorgensen classification, and shown in Fig. (1a ). The inflammation affecting the hard palatal mucosa was clearly visible in this group. These patients had chronic erythema and edema of the mucosa in contact with the fitting surface of the denture. Four patients wearing dentures, but with clinically healthy palatal mucosa appearing pale pink, were considered to be the control group, shown in Fig. (1b ). Ten additional patients without full dentures, with good oral hygiene and presenting no clinical signs of inflammation on the palatal mucosa, were used as the negative control group. The histology of biopsies from the palatal mucosa of healthy patients (Fig. 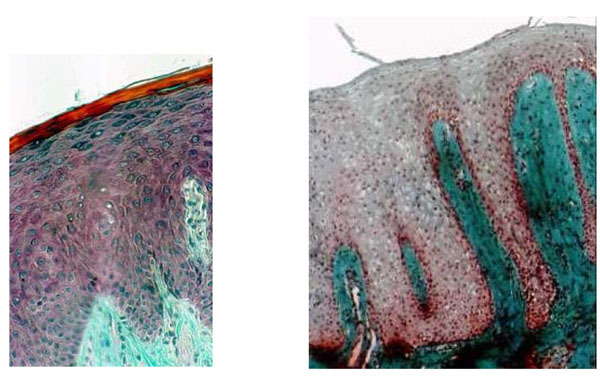 2a ) which had never been covered by a removable denture showed normal cuboidal keratinocytes aligned in a row and forming the first basal strata near the junction between the epithelium and underlying connective tissue (Fig. 3a ), CHM control. In patients with type II denture stomatitis according to the Budtz-Jorgensen classification, the junction between the epithelium and the underlying tissue was not clearly defined (Fig. 3b ). The keratinocyte cells appeared rounded and not aligned. Inflammation in the connective tissue was assessed as moderate showing partially indistinct tissue due to thinner collagen and disorganized lamina densa with inflammatory cells (Fig. 2b ) (Table 1). (2a) Histological section through healthy mucosa (CHM control) of hard palate never covered by full denture showing the classical srata in the epithelium. The interface between epithelium and connective tissue is an underlating surface, and the projections of connective tissue (papillae) interdigitating with epithelial ridges or pegs are clearly apparent. (b) Histological section of palatal mucosa showing denture stomatitis (Budtz-Jorgensen class II). DRS indicates a total absence of keratin and no clear division of the stata; scattered inflammatory cells are seen in the connective tissue. (a and b: Mallory Azan staining x 300). Histological sections of (a) healthy palate mucosa (control) never covered by a full denture showing the classical strata of keratinocytes near the basement membrane (BM). The interface between the BM and the underlying connective tissue exhibited a regular limit (arrow). (b) Histology of the BM in patients with class II denture stomatitis. Note that the junction between the epithelium and the underlying connective tissue is not clearly visible (arrow). (Mallory Azan staining, magnification x360). 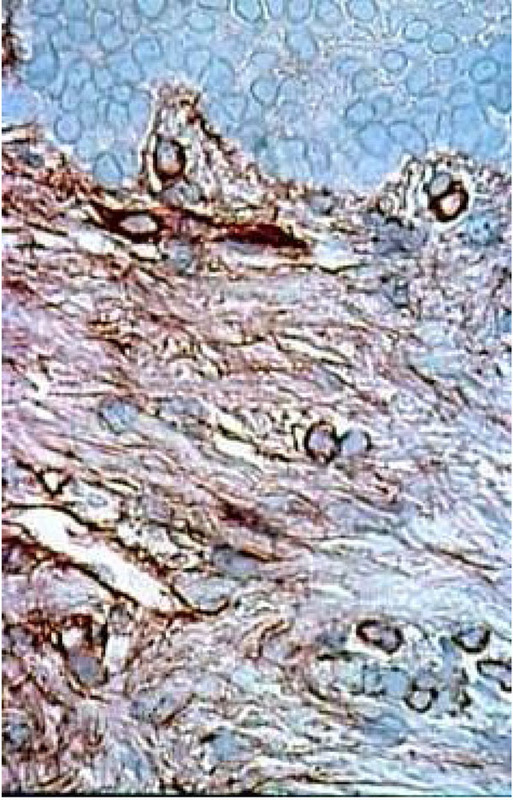 Immunohistochemical staining for E-cadherin, fibronectin and type VII collagen was performed to characterize the extracellular matrix in the epithelium at the interface between the epithelium and underlying connective tissue under full dentures in clinically healthy and pathologic palatal mucosa (type II Budtz-Jorgensen). 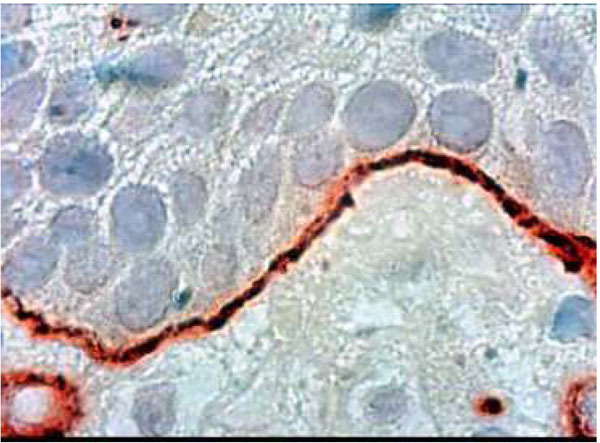 In the control healthy group, E-cadherin showed lower staining in the first strata of the epithelium (Fig. 4a ). 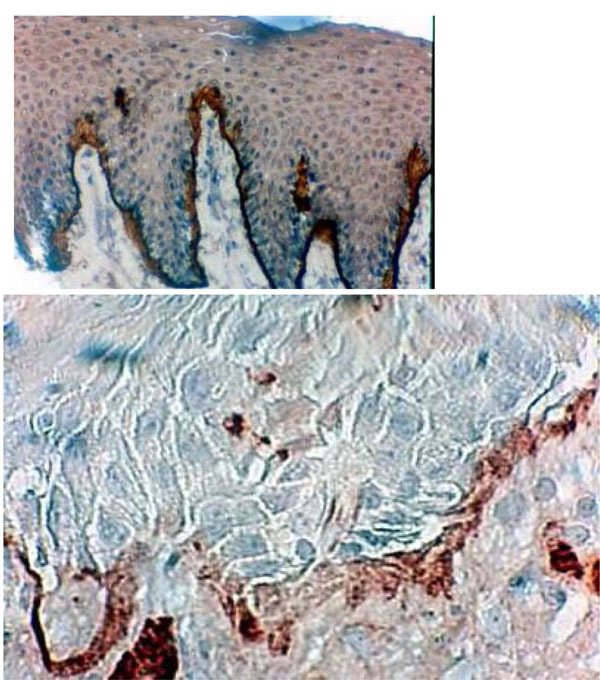 In denture-related stomatitis, the staining of E-cadherin revealed strong coloration (Fig. 4b ,c ). (4a) Histological section of healthy palatal mucosa (CHM). E-cadherin was detected by immunoperoxydase technique on the first srata of the epithelium. (b) Histological section of palatal mucosa of DRS shows the immunolocalisation of E-cadherin with strong staining in all of the epithelium. Connective tissue Infiltrate and basement membrane no clear. 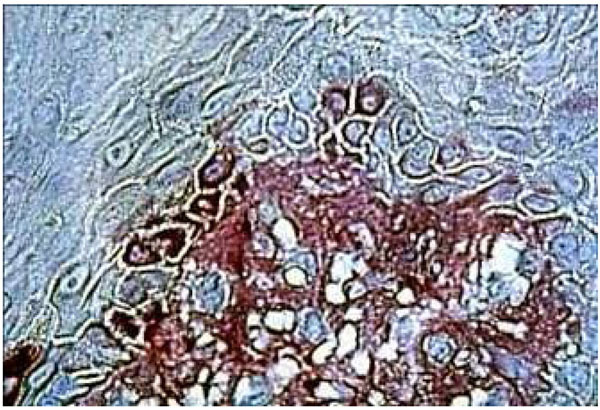 (c) Enlargement showing mild dysplasia of the epithelium with widening of space between keratinocytes. Type VII collagen formed a well-defined borderline exhibiting a thin linear staining compatible with normal epithelia (G1) (Fig. 5a ). Type VII collagen was less marked and more diffuse than in the control group (Fig. 5b ). It showed discontinuities in the borderline (G2- G3) (Fig. 5b ) (Table 2). Histological section of healthy palatal mucosa (CHM). Type VII collagen was detected by immunoperoxydase technique on anchoring fibrils around the BM. At this stage (G1), a thin regular, well-defined borderline is clearly visible. (Hematoxylin, x 360). Histological section of DRS showing immunolocalisation of type VII collagen between the BM and the underlying connective tissue. This frontier shows some thickenings and some discontinuities in borderline staining (Hematoxylin, x 360). Fibronectin immune localization corroborated these results. In the healthy control group, fibronectin was stained distinctly and finely in the extracellular matrix components of the underlying connective tissue. The absence of inflammation corresponded to the first category of the Thorup classification (Fig. 6a and Fig. 7a ). In the DRS group, fibronectin in the connective tissue appeared more disorganized in comparison to CHM (Fig. 6b ). Strong fibronectin staining was observed around some cells. These findings were in close correlation with the third category of the Thorup classification. In addition, fibronectin seemed to come through the basement membrane, leaching into all the gaps between keratinocytes (Fig. 7b ). Immunohistochemical staining of fibronectine in healthy palatal mucosa Low positive expression. The histological section of denture stomatitis mucosa type II (hyperplastic) Shows the immuno localisation of fibronectin and reveals the BM border. The structure of the connective tissue is partly blurred by inflammatory infiltrate. Histological section of healthy palatal mucosa (CHM). Fibronectin stain distinctly and finely the extracellular matrix components of the connective tissue under the BM. The absence of inflammation corresponding at the first category of Thorup classification. (Immuno staining, x 240). Histological section of DRS showing fibronectin in the underlying connective tissue staining near the BM. Fibronectin seems come through the BM. We can see strong staining around the keratinocytes (arrow). (Immuno staining, x 360). Furthermore, wide variations in type VII collagen and fibronectin expression were observed between the biopsy areas of the diseased patients. Smears of healthy and pathological subjects were observed under a light microscope. Many more parabasal, intermediate and superficial cells were observed in patients with DRS than in the healthy control group. As shown in Table 3, low numbers of colonies of Candida abicans were detected in healthy patients without full dentures. Patients wearing full prostheses for more than 3 years had similar numbers of yeast colonies to those found in the control group Table 3. The patients with type II denture stomatitis had higher numbers of colonies than the control groups. Most colonies isolated were Candida albicans. A second analysis performed 48 hours after plating indicated new species, such as Candida glabrata and Candida tropicalis, in 2 patients with denture stomatitis. Indeed, the number of samples is not sufficient for statistical analysis. Full denture resin plates covering the palatal mucosa may be regarded as a protection, oral factor exacerbating the effect of externally applied forces. Several studies have shown modifications of tissue occurring under removable dentures [11Freitas JB, Gomez RS, De Abreu MH, Ferreira E. Relationship between the use of full dentures and mucosal alterations among elderly Brazilians J Oral Rehabil 2008; 35(5): 370-4., 20Brunello DL, Mandikos MN. Constructions faults , age, gender, and relation medical health: factors associated with complaints in complete denture patients J Prosthet Dent 1998; 79: 545-.-25 Le Bars P, Piloquet P, Daniel A. Immunohistochemical localization of type IV collagen and and laminin (α1) in denture stomatitis J Oral Pathol Med 2001; 30: 98-103.]. Three histology levels of the mucosa are studied in tissue modification epithelium, basement membrane and connective tissue lamina propria. First, an intact epithelium provides a mechanical barrier and immunocompetent cells that regulate the immune responses of the palatal mucosa [26 Dale BA. Fascination with epithelia: architecture, proteins and functions J Dent Res 2003; 82: 866-9.]. E-cadherin is the chief component of the adherens junction assembly in the epithelium, and is also responsible for assembling the proteins of the tight junction [27Garant PR. Oral cells and tissues. 1st. Chicago, IL: Quintessence Publishing Inc 2003; pp. 25-80.-29 Shapiro L, Fanon AM, Kwong PD, Thompson A, Lehman MS, Grobel G. Structural basis of cell-cell adhesion by cadherins Nature 1995; 374: 327-7.]. The histology changes in this molecule reflect the degree of modification in the epithelium. The structural modifications in the epithelium were quite similar to those described in previous reports, with reduced thickness and alternating areas of hyperplasia and atrophy [38 Poulopoulos A, Belazi M, Epivatianos A, Velegraki A, Antoniades D. The role of Candida in inflammatory papillary hyperplasia of palate J Oral Rehabil 2007; 34: 685-92.]. The epithelial morphology showed irregularities, a lack of keratinization and disruptions in the basement membrane. Variations in the rete-ridge pattern were also observed. On the second level, the basement membranes play several biological roles. The basement membrane ensures mechanical support between the epithelium and lamina propria of cell layers [30 Yurchenco PD, Schittny JC. Molecular architecture of basement membrane FASEB J 1990; 4: 1577-90., 31 Mackenzie IC, Hill MW. Connective tissue influences on patterns of epithelia architecture and keratinization in skin and oral mucosa of the adult mouse Cell Tissue Res 1984; 235: 551-9.]. It forms a barrier between tissue compartments that impedes the transmigration of cells and passively regulates the exchange of macromolecules [32 Sugrue S, Hay ED. Response of basal epithelial cell surface and cytoskeleton to solubilized extracellular matrix molecules J Cell Biol 1981; 91: 45-54.]. The basement membrane serves as an interactive surface for cells, providing adhesion, cell shape, and migratory signals, but also communicating information for the regeneration and differentiation of cells [33 Barcellos-Hoff MH, Aggeler J, Ram TG, Bissel MJ. Functional differentiation and alveolar morphogenesis of primary mammary cultures on reconstituted basement membrane Development 1989; 105: 223-35.,34 Gumbiner B. Generation and maintenance of epithelial cell polarity Curr Opin Cell Biol 1990; 2: 881-7.]. Recent histological studies have shown that modifications in the basement membrane can occur in denture stomatitis. These studies demonstrate that the changes in the BM of the palatal mucosa may be divided into distinct lesion stages [25 Le Bars P, Piloquet P, Daniel A. Immunohistochemical localization of type IV collagen and and laminin (α1) in denture stomatitis J Oral Pathol Med 2001; 30: 98-103.,38 Poulopoulos A, Belazi M, Epivatianos A, Velegraki A, Antoniades D. The role of Candida in inflammatory papillary hyperplasia of palate J Oral Rehabil 2007; 34: 685-92.]. Moreover, the expression of type IV collagen and laminin (α1) can be detected and correlated to BM alterations and underlying connective tissue inflammation, and/or variations in epithelial morphology [25 Le Bars P, Piloquet P, Daniel A. Immunohistochemical localization of type IV collagen and and laminin (α1) in denture stomatitis J Oral Pathol Med 2001; 30: 98-103.,38 Poulopoulos A, Belazi M, Epivatianos A, Velegraki A, Antoniades D. The role of Candida in inflammatory papillary hyperplasia of palate J Oral Rehabil 2007; 34: 685-92.]. Studies have proposed that cells may dissociate from the basement membrane under various mechanical stimulations of the skin [35 Willsteed EM, Bhogal BS, Das A, et al. An ultrastuctural comparison of dermoepidermal separation techniques J Cutan Pathol 1991; 19: 1448-52.]. Mechanical stress areas may have a multifactorial aetiology; the pressure pain threshold might have a role for patients who experience chronic discomfort with their dentures [36 Ogawa T, Tanaka M, Ogimoto N, Okushi N, koyano K, Takeuchi K. Mapping, profiling and clustering of pressure pain threshold (ppt) in edentulous oral mucosa J Dent 2004; 32: 219-8.]. Consequently, this stress may influence the synthesis and organization of the extracellular matrix components, leading to inflammatory progression in epithelial and connective tissue [37 Aguirre JM, Verdugo F, Zamacona JM, Quindos G, Ponton J. Cytological changes in oral mucosa in denture-induced stomatitis Gerodontology 1996; 13: 63-7.]. The inflammation of the mucosa under removable dentures results in disruptions between the epithelium and connective tissue. These discontinuities in the basement membrane are generally observed in atrophic [25 Le Bars P, Piloquet P, Daniel A. Immunohistochemical localization of type IV collagen and and laminin (α1) in denture stomatitis J Oral Pathol Med 2001; 30: 98-103.] or hyperplastic [38 Poulopoulos A, Belazi M, Epivatianos A, Velegraki A, Antoniades D. The role of Candida in inflammatory papillary hyperplasia of palate J Oral Rehabil 2007; 34: 685-92.] denture stomatitis (Budtz-Jorgensen classe’s I-II-II). The diffuse characteristics of components such as Ecadherin, type VII collagen strongly suggests a causative relation with denture-related stomatitis. The histology and immunolocalization of extracellular components are considered to be potent indicators of inflammation in relation to the severity of the pathology. Type VII collagen has considerable importance for stabilizing the extracellular matrix [39 Woodley DT, Chang C, Saadat P, Ram R, Liu Z, Chen M. Evidence that anti-type VII collagen antibodies are pathogenic and responsible for the clinical, histological, and immunological features of epidermolysis bullosa acquisita J Invest Dermatol 2005; 124(5): 958-64.] and plays an important role in chemotropism, cell migration and cell adhesion during wound healing. In denture-related stomatitis, immunostaining of fibronectin provides information on the extracellular matrix and its influence on the junction between epithelia and underlying connective tissue [47 Chwarbauer J, Sechler JL. Fibronectin fibrillogenesis: a paradigm for extracellular matrix assembly Curr Opin Cell Biol 1999; 5: 622-7.]. The differences between atrophic and hyperplastic [25 Le Bars P, Piloquet P, Daniel A. Immunohistochemical localization of type IV collagen and and laminin (α1) in denture stomatitis J Oral Pathol Med 2001; 30: 98-103.] denture stomatis may be distinguished by using fibronectin staining. Using immunohistochemical staining of fibronectin in hyperplastic DRS, we showed a strong linear positive expression in the BM and around blood vessels, as well as in the extracellular connective tissue matrix [38 Poulopoulos A, Belazi M, Epivatianos A, Velegraki A, Antoniades D. The role of Candida in inflammatory papillary hyperplasia of palate J Oral Rehabil 2007; 34: 685-92.]. Here, we also demonstrated with immunohistochemical staining that there was fibronectin around the keratinocytes under the BM in the case of atrophic DRS. It is commonly accepted that, both the pressure of wearing full dentures and associated inflammation may explain the difference between hyperplastic and atrophic denture stomatitis. The immunohistochemical staining of fibronectin in the lamina propria in atrophic DRS (class II Budtz- Jorgensen) showed a disorganized structure, clearly different from the underlying connective tissue in the clinically healthy palatal mucosa. In some areas, the fibronectin stain was stronger than in the healthy palatal mucosa, and surrounded the keratinocytes near the basement membrane. Based on this observation, we suggest that, this overstepping of the BM can convey a possibility of penetration by fibronectin. The presence of the Candida biofilm was considered to be a characteristic of the denture stomatitis pathology [1Shulman JD, Rivera-Hidalgo F, Beach MM. Risk factors associated with denture stomatitis in the united States J Oral Pathol Med 2005; 34(6): 340-6., 24 Ramage G, Tomsett K, Wickes BL, Lopez-Ribot JL, Redding SW. Denture stomatitis : a role Candida biofilms Oral Surg Oral Med Oral Pathol Oral Radiol Endod 2004; 98(1): 53-9., 48 Marcos-Arias C, Lopez Vicente J, Sahand I H, et al. Isolation of candida dubliniensis in denture stomatitis Arch Oral Biol 2009; 54(2): 127-31., 49 Zomorodian K, Haghighi NN, Rajaee N, et al. Assessment of Candida species colonization and denture-related stomatitis in complete wearers Med Mycol 2011; 49(2): 208-11.]. Preceding work suggested that the lack of keratinization facilitates fungal infections and subsequent disruption of the denture-supporting tissues [25 Le Bars P, Piloquet P, Daniel A. Immunohistochemical localization of type IV collagen and and laminin (α1) in denture stomatitis J Oral Pathol Med 2001; 30: 98-103. ]; finding the same cytological changes in the oral mucosa in denture-induced stomatitis confirmed this finding [37 Aguirre JM, Verdugo F, Zamacona JM, Quindos G, Ponton J. Cytological changes in oral mucosa in denture-induced stomatitis Gerodontology 1996; 13: 63-7.]. However, the samples are not sufficient in our studies for a statistical analysis concerning the mycological population. A larger sample group will be necessary to confirm this result. The fungus, Candida albicans, interacts with epithelial cells under denture both as a normal commensal and as an invasive pathogen. Adherent C.albicans cells can invade epithelial surfaces both by penetrating into individual epithelial cells, and by degrading interepithelial cell junctions and passing between epithelial cells [50 Villar CC, Kashleva H, Nobile CJ, Mitchell AP, Dongari-Bagtzoglou A. Mucosal tissue invasion by Candida albicans is associated with E-cadherin degradation, mediated by transcription factor Rim 101 p and protease Sap5p Infect Immun 2007; 75: 2126-35.]. Invasion into epithelial cells is mediated by both induced endocytosis and active penetration, whereas degradation of epithelial cell junction proteins , such as E-cadherin occurs mainly via proteolysis by secreted aspartyl proteinases [51 Zhu W, Filler S G. Interactions of Candida albicans with epithelial cells Cell Microbiol 2010; 12(3): 273-82.]. Studies show the potential for C. albicans to manipulate the stratified epithelial cells to a state of differentiation that is more [52 Rollenhagen C, Wöllert T, Langford G M, Sundstrom P. Stimulation of cell motility and expression of late markers of differentiation in human oral keratinocytes by Candida Albicans Cell Microbiol 2009; 11(6): 946-66.]. A variety of morphological changes in the BM are known to occur in inflammatory diseases like DRS[25 Le Bars P, Piloquet P, Daniel A. Immunohistochemical localization of type IV collagen and and laminin (α1) in denture stomatitis J Oral Pathol Med 2001; 30: 98-103.]. C. albicans has a significant effect on tissue structure through BM protein (laminin-5 and type IV collagen) [53 Claveau I, Mostefaoui Y, Rouabhia M. Basement membrane protein and matrix metalloproteinase deregulation in engineered human oral mucosa following infection with Candida Albicans Mat Biol 2004; 23: 477-86.]. C. albicans possesses the ability to adhere specifically to extracellular matrix, as compared with other Candida species or oral bacteria [54 Makihira S, Nikawa H, Tamagami M, et al. Bacterial and candida adhesion to intact denatured collagen in vitro Mycoses 2002; 45: 389-92.]. In tissues expressing laminin-332, such as the junctional epithelium of the gingivae, Candida may also invade the epithelial basement membrane possibly initiating systemic infections [55 Pärnänen P, Meurman JH, Samaranayake L, Virtanen I. Human oral keratinocyte E-cadherin degradation by Candida albicans and Candida glabrata J Oral Pathol Med 2010; 39: 275-8.]. In the current study, we examined the expression of three molecules localized mainly in the epithelial surface, the basement membrane and the underlying connective tissue, associated with a diagnosis of type II denture-related stomatitis. We showed the widening of the intercellular space of the epithelium and fibronectin around the keratinocytes in the basement membrane. The combined expression of E-cadherin, collagen type VII and fibronectin around the BM may be an early consequence of stomatitis, and may help diagnose denture-related stomatitis. The widening in the extracellular matrix of the mucosa epithelial facilitates the Candida infection and this disorder but may also be potentiated to pressure and/or suction the basic prosthetic during different functions. A good anatomical fit for the full denture and control of yeast are currently the most relevant strategies to prevent the occurrence of denture-related stomatitis. These findings, however, warrant further investigation, as re-establishment of the epithelial barrier is a functional necessity for a healthy palatal mucosa under a removable denture. This preliminary study is limited by the small number of samples. More biopsies are needed to confirm and increase the relevance of our results. Shulman JD, Rivera-Hidalgo F, Beach MM. Risk factors associated with denture stomatitis in the united States J Oral Pathol Med 2005; 34(6): 340-6. Gendreau L, Loewyzg ZG. Epidemiology and etiology of denture stomatitis J Prosthodont 2011; 20(4): 251-60. Jennings KJ, Mac Donald DG. Histological, microbiological and haematological investigations in denture-induced stomatitis J Dent 1990; 18: 102-6. Cunha-Cruz J. One in 3 removable denture users in the United States has denture stomatitis J Evid Based Dent Pract 2006; 6(2): 197-8. Coulthwaite L, Verran J. Potential pathogenic aspects of denture plaque Br J Biomed Sci 2007; 64(4): 180-9. Arun R, Hemalatha R, Arun KV, Kumar T. E-cadherin and CD1a expression in gingival epithelium in periodontal health, disease and post-treatment Indian J Dent Res 2010; 21: 396-401. Sakai LY, Keene DR, Morris NP, Burgeon RE. Type VII collagen is a major structural component of anchoring fibrils J Cell Biol 1986; 103: 1577-86. Osawa T, Liang JC, Xie X, Nozaka Y. Study on the epidermal basement membrane (2): localization of type VII collagen determined by immunoscanning electron microscopy with back scattered electron imaging Connect Tissue 1998 b; 30: 11-3. Warnakulasuriya S, Reibel J, Bouquot J, Dabelsteen E. Oral epithelial dysplasia classification systems: predictive value, utility, weaknesses and scope for improvement J Oral Pathol Med 2008; 37: 127-33. Figueiral MH, Azul A, Pinto E, Fonseca PA, Branco FM, Scully C. Denture related stomatitis : identification of aetiological and predisposing factors: a large cohort J Oral Rehabil 2007; 34(6): 448-55. Freitas JB, Gomez RS, De Abreu MH, Ferreira E. Relationship between the use of full dentures and mucosal alterations among elderly Brazilians J Oral Rehabil 2008; 35(5): 370-4. Sachdeo A, Haffajee A, Socransky S. Biofilms in the edentulous oral cavity J Prosthodont 2008; 17: 348-56. Budtz-Jorgensen E. Oral mucosal lesions associated with the wearing of removable dentures J Oral Pathol 1981; 10: 65-80. Newton AV. Denture sore mouth Br Dent J 1962; 112: 359-60. Guesdon JL. The use of avidin-biotin interaction in immunoenzymatic techniques J Histochem Cytochem 1979; 27: 1131-9. Cordell JL. Immunoenzenmatic labelling of monoclonal antibodies using immunecomplexes of alkaline phosphatase and monoclonal anti-alkaline phosphatase conjugates in immunohistochemistry J Histochem Cytochem 1984; 3é: 219-9. Christensen L. Fibronectin, laminin and tetranectin in human breast cancer with special attention to extracellular matrix APMIS Suppl 1992; 100(suppl): 6-39. Thorup AK, Dabelsteen E, Schou S, Gil SG, Carter WG, Reibel J. Differential expression of integrins and laminin 5 in normal oral epithelia AMPIS 1997; 105: 519-30. Thorup AK, Reibel J, Schiodt M, et al. Can alterations in integrins and laminin -5 expression be used as markers of malignancy? APMIS 1998; 106: 1170-80. Brunello DL, Mandikos MN. Constructions faults , age, gender, and relation medical health: factors associated with complaints in complete denture patients J Prosthet Dent 1998; 79: 545-. Wilson J. The aetiology, diagnosis and management of denture stomatitis Br Dent J 1998; 185: 380-5. Kulak Y, Arikan A, Delibalta N. Comparison of three different treatment methods for generalized denture stomatitis J Prosthet Dent 1994; 72: 283-8. Xie Q, Närhi TO, Nevalainen JM, Wolf J, Ainamo A. Oral status and prosthetic factors related to residual ridge resorption in elderly subjects Acta Odontol Scand 1997; 55: 306-13. Ramage G, Tomsett K, Wickes BL, Lopez-Ribot JL, Redding SW. Denture stomatitis : a role Candida biofilms Oral Surg Oral Med Oral Pathol Oral Radiol Endod 2004; 98(1): 53-9. Le Bars P, Piloquet P, Daniel A. Immunohistochemical localization of type IV collagen and and laminin (α1) in denture stomatitis J Oral Pathol Med 2001; 30: 98-103. Dale BA. Fascination with epithelia: architecture, proteins and functions J Dent Res 2003; 82: 866-9. Garant PR. Oral cells and tissues. 1st. Chicago, IL: Quintessence Publishing Inc 2003; pp. 25-80. Horiguchi Y, Furukawa F, Fujita M, Imamura S. Ultrastructural localisation of E-Cadherin cell adhesion molecule on the cytoplasmic membrane of keratinocytes in vivo and in vitro J Histochem Cytochem 1994; 42: 1333-40. Shapiro L, Fanon AM, Kwong PD, Thompson A, Lehman MS, Grobel G. Structural basis of cell-cell adhesion by cadherins Nature 1995; 374: 327-7. Yurchenco PD, Schittny JC. Molecular architecture of basement membrane FASEB J 1990; 4: 1577-90. Mackenzie IC, Hill MW. Connective tissue influences on patterns of epithelia architecture and keratinization in skin and oral mucosa of the adult mouse Cell Tissue Res 1984; 235: 551-9. Sugrue S, Hay ED. Response of basal epithelial cell surface and cytoskeleton to solubilized extracellular matrix molecules J Cell Biol 1981; 91: 45-54. Barcellos-Hoff MH, Aggeler J, Ram TG, Bissel MJ. Functional differentiation and alveolar morphogenesis of primary mammary cultures on reconstituted basement membrane Development 1989; 105: 223-35. Gumbiner B. Generation and maintenance of epithelial cell polarity Curr Opin Cell Biol 1990; 2: 881-7. Willsteed EM, Bhogal BS, Das A, et al. An ultrastuctural comparison of dermoepidermal separation techniques J Cutan Pathol 1991; 19: 1448-52. Ogawa T, Tanaka M, Ogimoto N, Okushi N, koyano K, Takeuchi K. Mapping, profiling and clustering of pressure pain threshold (ppt) in edentulous oral mucosa J Dent 2004; 32: 219-8. Aguirre JM, Verdugo F, Zamacona JM, Quindos G, Ponton J. Cytological changes in oral mucosa in denture-induced stomatitis Gerodontology 1996; 13: 63-7. Poulopoulos A, Belazi M, Epivatianos A, Velegraki A, Antoniades D. The role of Candida in inflammatory papillary hyperplasia of palate J Oral Rehabil 2007; 34: 685-92. Woodley DT, Chang C, Saadat P, Ram R, Liu Z, Chen M. Evidence that anti-type VII collagen antibodies are pathogenic and responsible for the clinical, histological, and immunological features of epidermolysis bullosa acquisita J Invest Dermatol 2005; 124(5): 958-64. Hynes RO. Molecular biology of fibronectin Ann Rev Cell Biol 1985; 1: 67-90. Hynes RO. Fibronectines In: Kreis T, Kale R, Eds. Guidebook to extracellular matrix and adhesion proteins. Oxford: Oxford University Press 1993; pp. 56-8. Hotta T, Yokoo S, Terashi H, Komort T. Clinical and histopathological analysis of healing process of intraoral reconstruction with ex vivo produced oral mucosa equivalent Kobe J Med Sci 2007; 53(1-2): 1-14. Xie DL, Meyers R, Hommandberg GA. Fibronectin fragments in osteo arthritic synovial fluid J Rheumato 1992; 19: 1448-52. Werb Z, Tremble P, Damsky CH. Regulation of extracellular matrix degradation by cell-extracellular matrix interactions Cell Diff Dev 1990; 32: 299-306. Hynes RO. Fibronectins 1990; 24-175. Schwarzbauer J. Basement membranes: Putting up the barrier Curr Biol 1999; 9: 242-4. Chwarbauer J, Sechler JL. Fibronectin fibrillogenesis: a paradigm for extracellular matrix assembly Curr Opin Cell Biol 1999; 5: 622-7. Marcos-Arias C, Lopez Vicente J, Sahand I H, et al. Isolation of candida dubliniensis in denture stomatitis Arch Oral Biol 2009; 54(2): 127-31. Zomorodian K, Haghighi NN, Rajaee N, et al. Assessment of Candida species colonization and denture-related stomatitis in complete wearers Med Mycol 2011; 49(2): 208-11. Villar CC, Kashleva H, Nobile CJ, Mitchell AP, Dongari-Bagtzoglou A. Mucosal tissue invasion by Candida albicans is associated with E-cadherin degradation, mediated by transcription factor Rim 101 p and protease Sap5p Infect Immun 2007; 75: 2126-35. Zhu W, Filler S G. Interactions of Candida albicans with epithelial cells Cell Microbiol 2010; 12(3): 273-82. Rollenhagen C, Wöllert T, Langford G M, Sundstrom P. Stimulation of cell motility and expression of late markers of differentiation in human oral keratinocytes by Candida Albicans Cell Microbiol 2009; 11(6): 946-66. Claveau I, Mostefaoui Y, Rouabhia M. Basement membrane protein and matrix metalloproteinase deregulation in engineered human oral mucosa following infection with Candida Albicans Mat Biol 2004; 23: 477-86. Makihira S, Nikawa H, Tamagami M, et al. Bacterial and candida adhesion to intact denatured collagen in vitro Mycoses 2002; 45: 389-92. Pärnänen P, Meurman JH, Samaranayake L, Virtanen I. Human oral keratinocyte E-cadherin degradation by Candida albicans and Candida glabrata J Oral Pathol Med 2010; 39: 275-8.